Model PY9000D is used for measuring and controlling room pressure, duct static pressure, etc., for clean rooms and general air conditioning applications. 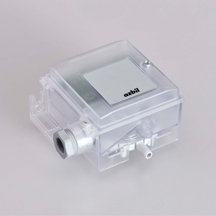 Model PY9000D is a differential pressure transmitter that uses a ceramic cantilever sensor. Deflection of the ceramic cantilever caused by differential pressure is sensed as a change in electrical resistance, which is converted to a current signal roportional to even a slight differential pressure. The detected differential pressure is then transmitted as a 4-20 mA DC signal.